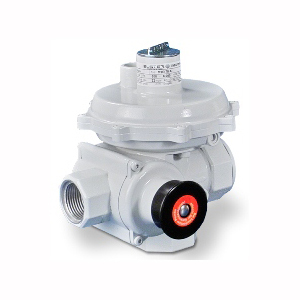 The M2R-75A is a two stage pressure regulator designed for commercial and industrial applications. It is suitable for town gas, natural gas, air and LPG. The resetting and adjustment of the safety shut off valve has a very user friendly design and is designed to prevent third party manipulation. Integrated safety shut off valve is standard, relief mechanism is optional. Outlet pressure range 1.8 to 40 kPa depending on the installed pressure spring. Typical flow capacity is 75 m³/h with an inlet pressure range of 50 to 500 kPa. Inlet pressure resistant up to 1600 kPa. Over and under pressure cut off available with manual or automatic reset. For more information, visit the Software section.